Las Vegas, Nevada, November 2018 –The 1000 Books Foundation is proud to present a FREE comprehensive letter writing app to help your child learn to write the alphabet using recommended stroke order and placement. The FREE app uses letter grid lines endorsed by top educators and penmanship experts to help your child visualize how the letters should line up. Both upper and lowercase letters are included. 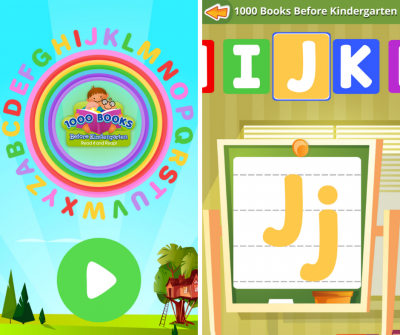 “The 1000 Books Before Kindergarten ABC Letter Writing App is a natural extension of our reading challenge to help prepare children for kindergarten. The app is a fun and easy way to learn the alphabet and how to write each letter, too” said Diane Lee, Executive Director of the 1000 Books Foundation. The 1000 Books Foundation would like to recognize the law offices of Luh & Associates for providing the funding to create the app. The 1000 Books Foundation would also like to thank Alumni Ambassador YouTuber Goblin Jor (link to visit and subscribe) for performing the voice over work for the app. “My parents read a lot to me when I was growing up. I always try to lend a hand and now my voice to helping children learn their ABCs and how to write their letters. Thank you everyone for visiting my YouTube channel and subscribing, your support really means a lot to me,” said Goblin Jor.